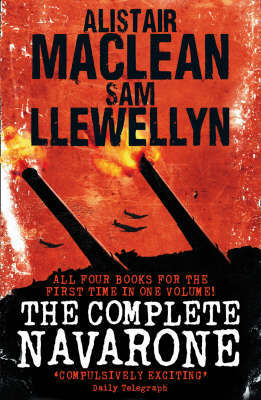 The Guns of Navarone and its three sequels, in which the same characters are sent on other wartime missions, together in one volume for the first time to mark the 50th anniversary of the original book . THE GUNS OF NAVARONE Mallory, Miller and Andrea are united into a lethally effective team. Their mission: to silence the impregnable guns set in the tall cliffs of Navarone. On their success or failure rests one of the most critical offensives of the Second World War. FORCE 10 FROM NAVARONE Almost before the last echoes of the famous guns have died away, the three Navarone heroes are parachuted into war-torn Yugoslavia to rescue a division of partisans and fulfil a secret mission, so deadly that it must be hidden even from their own allies. STORM FORCE FROM NAVARONE The surviving commandos are sent on a perilous journey through the Pyrenees to disable the greatest threat to the impending D-Day landings: the 'Werwolf' U-boats. But their Basque guides declare it mission impossible - D-Day is less than six days away. THUNDERBOLT FROM NAVARONE Summoned back to Naval HQ, Mallory, Miller and Andrea are given a final assignment: to reconnoitre the Greek island of Kynthos and destroy the German facilities developing the lethal V3 weapon. A rocket expert is to accompany them - but can he be trusted not to turn the operation into a suicide mission?